VERNORS GINGER ALE mural wall advertisement DETROIT photo picture art print for sale. 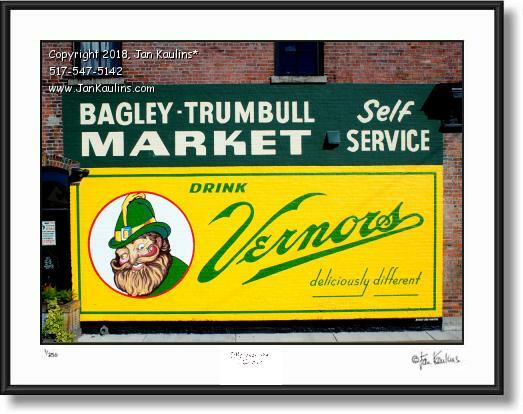 This DETROIT VERNOR'S wall mural sign photo picture art print for sale is of a wonderful vintage image of an old Vernor's Ginger Ale sign featuring the iconic VERNOR'S GNOME on the side of the old brick building in Corktown of the Bagley-Trumbull Market on Trumbull St., just a few blocks south of the old Detroit Tiger Stadium. It is a wonderful colorful image harkening back to the early days of Detroit and one of its most memorable iconic drinks. It is one of the newest artistic images in his most recent series of photographs. Each photograph has been created from multiple bracketed photographic digital exposures and then layered together into one photographic image. It is then ‘tone-mapped’ where individual areas of the photo, as well as contrast, saturation and other qualities of the image can be artistically manipulated to bring out the artistic effects that make these photos so visually unique. Some of the photos in this series are even further enhanced for artistic effect giving them an almost painterly or graphic silkscreened look.